Six weeks after the ceasefire which brought the summer’s conflict in Israel and the Gaza Strip to an end came into effect and three weeks after the publication of Yolande Knell’s big feature on Shuja’iya ( “Gaza: Life amid the rubble” – September 15th), the BBC News website published an article titled “Israeli families scarred by Gaza war” on October 6th. The article – which appeared on the website’s main homepage as well as on its Middle East page – is specifically introduced to readers as ‘balance’ to Knell’s earlier feature. Although on the whole factually accurate, the article does not adequately inform readers of almost three hundred missile attacks on Israeli civilians carried out by terrorists in the Gaza Strip during June and the first week of July, meaning that readers are not aware of why Israel needed to “restore quiet to its communities” in the first place or of the efforts made by Israel to avoid a military operation. “This past summer, millions of Israelis – from the small southern city of Sderot to the bustling coastal metropolis of Tel Aviv – lived under regular rocket attacks from the Palestinian militant group Hamas in Gaza. 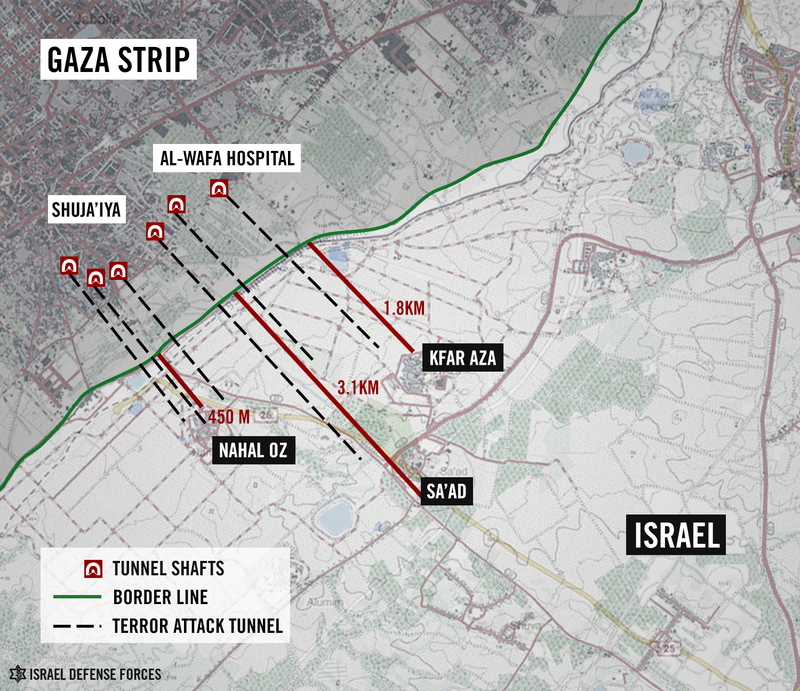 The section relating to Hamas’ cross-border attack tunnels fails to make any mention of the numerous attacks carried out via those tunnels during the conflict, including that of July 17th which made the subsequent ground operation inevitable. “However this operation uncovered a far sinister threat against Israeli citizens, that which Israel calls the “terror tunnels”. These are a vast underground network with numerous shafts, many of which led from inside Gaza to Israeli communities in southern Israel. A tunnel opening was even found near a kibbutz dining hall and kindergarten. Israelis were shocked by media reports that Hamas had planned on using such tunnels to commit a mass attack on Rosh Hashanah, the Jewish new year. Moreover, no effort is made to clarify to BBC audiences the all-important connection between the tunnels described in this article and the scenes of destruction described by Yolande Knell in her earlier feature, even though almost a third of the tunnels which Chernofsky correctly notes were decommissioned during the operation originated in the Shuja’iya neighbourhood which was the subject of Knell’s big feature and a subsequent radio report. But perhaps the most notable thing about this report is its timing. Prior to Operation Protective Edge Israeli towns and villages located in the western Negev were under escalated attack by terrorists in the Gaza Strip for almost five weeks and yet – as was similarly the case in the period preceding Operation Pillar of Defence in 2012 – at no point during that period did even one BBC reporter set foot in Sderot, Nahal Oz or Ashkelon. 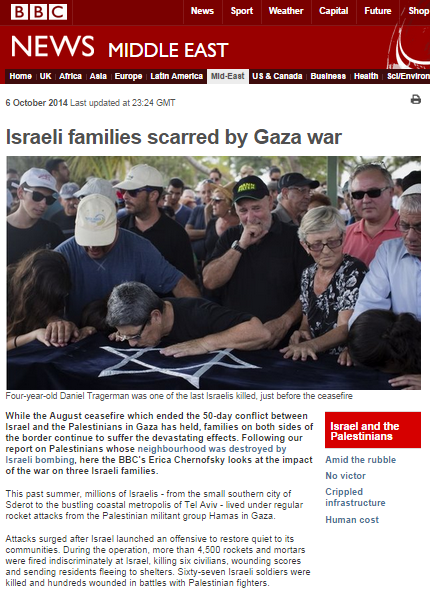 BBC audiences did not hear the voices of fearful mothers residing in the kibbutzim just a few hundred yards from the border with Gaza or those of people still living under constant threat of missile attack even though they were uprooted from their homes during Israel’s disengagement from the Gaza Strip nine years ago before Israel began its military operation. Had such voices been brought to BBC audiences at the appropriate time, they may have gained a more balanced view of the subsequent conflict. So whilst Erica Chernofsky’s article is of course welcome, it can do little at this late juncture to address the inaccurate impressions created by weeks of imbalanced BBC reporting.